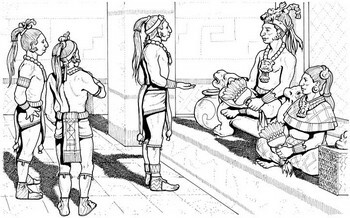 One of the ways that the Mayan peoples competed against each other was by playing what has been called the Ball Game. They used a rubber ball, about 20 inches in diameter, to play the Game, which was played on a stone "court" whose measurements varied. (The largest one found so far measures 459 feet by 114 feet.) The court had walls that sloped inward, and hanging high on the walls were stone rings. The goal of the game was to pass the ball around, without having it touch your hands, and then get the ball to pass through one of the rings. Since the rings were so high and players were not allowed to use their hands, it was extremely difficult to get the ball through a ring. In fact, when a player did manage to get a ball through a ring, that usually ended the game. The game ended otherwise when the ball touched the ground. 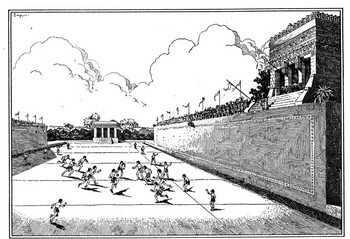 The Mayan Ball Game was a solemn experience, filled with ritual importance. Religious leaders attended, as did most chieftains and other government leaders. Sacred songs were sung and played. Other religious activities took place as well. The winners of the game were treated as heroes and given a great feast. The penalty for losing a game was sometimes unusually harsh: death. The leader of the team who lost the game was sometimes killed. 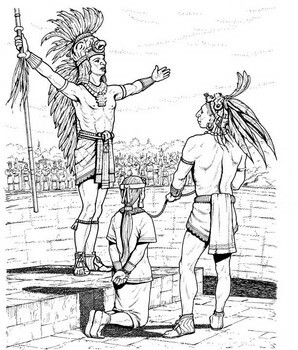 This fit in with the Mayan belief that human sacrifice was necessary for the continued success of the peoples' agriculture, trade, and overall health. The goal was also NOT to touch the ball with one's hands, like soccer is today.